The Knicks vowed revenge and promised to play hard from the start. Last time the two teams met, the Bulls outscored the Knicks in the first quarter and kept the momentum going until the final buzzer when Kristaps Porzingis’ three pointer bounced off the rim. This time, the Knicks controlled the game from the beginning and managed to build a 15 point lead later in the second quarter. 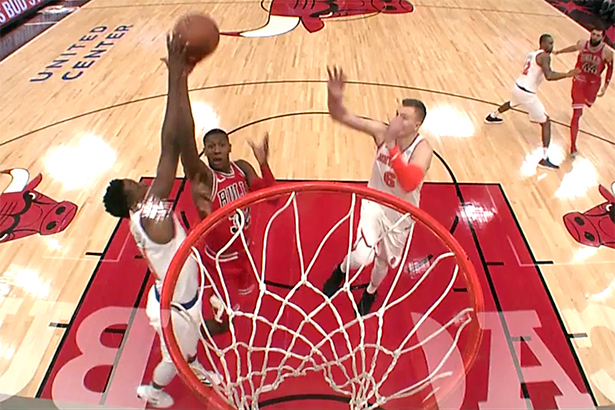 Led by Kris Dunn, the Bulls successfully came back after a 15-2 run and with 3:01 on the clock, Justin Holiday’s three pointer tied the game at 86. For the next 2 and a half minutes no team was able to find a way to score, until Lauri Markkanen finished on fast break with a dunk that gave Chicago their first lead since the first quarter. Jarret Jack missed a free throw, allowing the Bulls to increase their lead to three, after Dunn completed a couple of frees. The Knicks had little over 7 seconds on the clock to draw a play that would send the game in the overtime. Michael Beasley almost turned the ball over after struggling to get the inbound pass but eventually found Enes Kanter free, behind the arc. With neither Porzingis, nor Doug McDermott open, Kanter shot the ball himself, and missed. The Bulls wrapped it 87-92 and won their 9th game of the last 11. Chicago were 3-20 earlier this month but since then, sparked by the return of Nikola Mirotic, they managed to overcome and are now 12-22. Porzingis finished with 23 points and 6 rebounds, Courtney Lee followed with 17 buckets and Jack combined 11 points and 8 assists. The Knicks lost their third in a row, dropped to .500 and continue to struggle on the road. Their schedule won’t help much as New York will play 6 of their next 9 games on the road and right after that, they will connect seven straight away from Madison Square Garden.